By 1944, Irene Dunne was one of the top female stars in Hollywood. A four-time Academy Award nominee for Best Actress, she was in demand by all the major Hollywood studios. In 1943, Dunne signed on to star in a picture at Metro Goldwyn Mayer. A Guy Named Joe paired the actress with Spencer Tracy and a young newcomer named Van Johnson. During filming Johnson was involved in a serious car accident. Dunne and Tracy didn’t want to replace Johnson, so production was delayed while he recuperated. Since Dunne was already on the lot, M-G-M scooped her up for The White Cliffs of Dover. 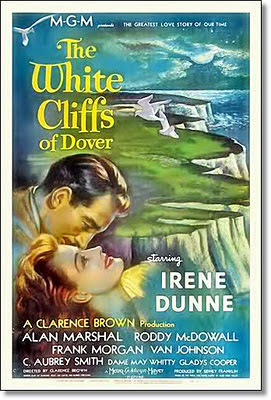 The White Cliffs of Dover is based on a verse novel The White Cliffs by Alice Duer Miller published in 1940. The novel was an instant success and sold almost a million copies. Duer Miller was a popular writer and screenwriter. In fact one of her stories was made into the musical Roberta starring Dunne in 1935. The White Cliffs of Dover focuses on a young American woman, Susan Dunn, played by Dunne and her father (the irascible Frank Morgan) who are touring London before the outbreak of World War I. She meets a young British aristocrat and army officer, Sir John Asherwood (Alan Marshall). After a whirlwind courtship they marry, but their honeymoon and marriage is cut short. Susan Dunn Asherwood remains in her adopted country and has a son, John Jr.
Like Mrs. Miniver (1942), The White Cliffs of Dover was popular with wartime audiences on both sides of the Atlantic. The novel on which it is based, cemented the relationship between the United States and The United Kingdom, during the war years. The movie cost $2,343,000 to produce, earned $4,045,000 in the U.S. and another $2,249,00 in foreign receipts making it a blockbuster hit and a good choice as the M-G-M 20th Anniversary film. In a famous photograph of M-G-M movie stars, commemorating its 20th anniversary, Dunne, technically not a studio contract player, is seated in the front row two seats to the right of studio chief, Louis B. Mayer. It’s a tribute to Dunne’s popularity (and Mayer’s keen marketing sense) that she was included in this iconic image. More stars than are in the heavens: M-G -M celebrates 20 years. Dunne is in the front row fourth from right.